Thousands of Americans have houses contaminated by defective Chinese drywall; now a new group of homeowners say they are experiencing similar problems -- but their homes are built with drywall made in the United States. Two years after thousands of Americans learned that defective Chinese drywall had contaminated their houses, a new group of homeowners say they are experiencing similar problems—but their homes are built with drywall made in the United States. Ninety-seven homeowners in four states have joined lawsuits against U.S. drywall manufacturers in the past year, claiming that their drywall is releasing enough sulfur gas to corrode wiring and appliances and cause headaches, nosebleeds, labored breathing and irritated eyes—complaints that until now have been mostly associated with Chinese drywall. Many families have abandoned their homes, fearing long-term health problems. Some are facing foreclosure, or even bankruptcy. Plaintiffs in the largest lawsuit, which involves 93 Florida homes, blame the problem on drywall made by National Gypsum, one of the nation’s largest drywall manufacturers. Separate cases have been filed against National Gypsum in Arizona and Alabama. Two other lawsuits, each involving a single homeowner, have also been filed. One, in South Dakota, is against U.S. Gypsum. The other, filed by a Florida couple against Georgia Pacific, has been settled out of court. All the manufacturers deny that anything is wrong with their products. Lawsuits represent one side of a legal dispute, and none of the American drywall cases have come to trial. But court records show that many of the plaintiffs have test results from independent laboratories that show high levels of sulfur gas coming from the walls of their homes. 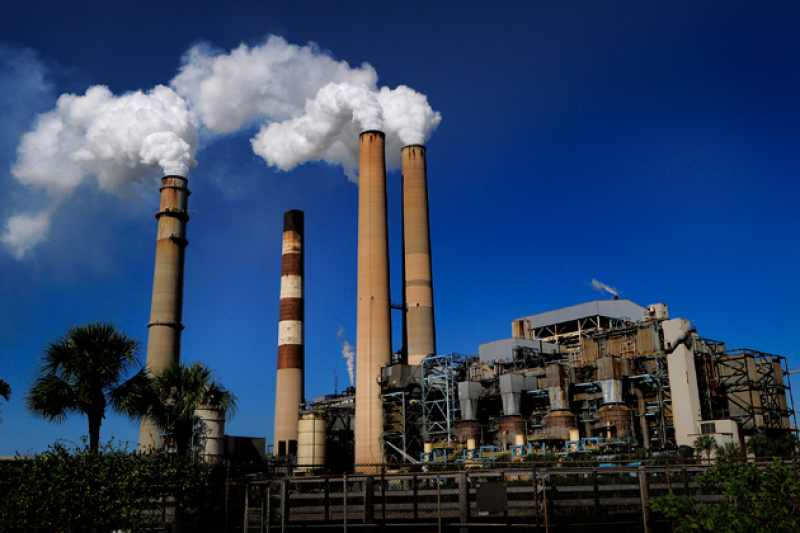 The plaintiffs’ attorneys say in court documents that the outgassing may somehow be connected to synthetic gypsum, a form of coal ash produced by the scrubbing process that removes sulfur dioxide from the emissions of coal-fired power plants. Nearly half of American drywall is now made with this synthetic product, known as flue gas desulfurized gypsum or FGD gypsum. Despite its increasing popularity, synthetic gypsum isn’t regulated by the federal government. In fact, the Environmental Protection Agency supports the reuse of FGD gypsum because it protects the air, recycles waste that would otherwise go to a landfill and creates useful products. The industry has voluntary standards for drywall, but they apply only to fire resistance and strength. Michael Gardner, executive director of the Gypsum Association, a trade group that represents the drywall industry, said additional oversight is unnecessary. “There has never been a problem with the use of FGD gypsum wallboard since its inception,” Gardner said. At least one of the lawsuits also points to another possible cause: that the defective drywall was made with scrap from recycled drywall—perhaps Chinese drywall. In September, the U.S. Consumer Product Safety Commission commissioned a study of a small group of homes with problematic American drywall, similar to the study it completed last year of homes with Chinese board. But figuring out what is causing the problems — and who should pay to fix them — is likely to be a long and laborious process. After two years of studying Chinese drywall, the agency still hasn’t figured out what caused it to release sulfur gases, and the homeowners’ lawsuits are still mired in the courts. The CPSC’s main theory in the Chinese drywall cases is that one or several of the mines that supplied the manufacturers with natural gypsum contained a high concentration of sulfur. But CPSC inspectors say it’s also possible that some of the defective Chinese drywall was produced with synthetic gypsum from Chinese power plants. For homeowners who believe their houses have been contaminated by U.S.-made drywall, the scientific question of what is causing the problem is overshadowed by the more immediate question of how they will survive the financial disaster they now face. The CPSC’s preliminary guidelines for remediating homes made with defective drywall say all the drywall and electrical wiring should be replaced, an undertaking that can cost $100,000 or more. Mraz and her husband both have severe health problems, and the house was built to accommodate Joseph Mraz’s wheelchair. Soon after they moved in, however, they noticed a strong sulfuric smell and the coils on their air conditioner corroded—a telltale sign of defective drywall. Joseph Mraz’s childhood asthma returned for the first time in the Mraz’s 29-year marriage. When his breathing became so labored that he had to be hospitalized, the couple’s doctors urged them to move out of the house. They are now renting an apartment, and Julie Mraz said her husband’s breathing problems have improved. John and Katherine Kallas, who built their dream home in Lehigh Acres, Fla., in 2005, are among more than a dozen people ProPublica and the Sarasota Herald-Tribune interviewed who say that defective American drywall has upended their lives. In October 2005, the Kallases began paying a $180,000 mortgage on a home they had built on a lot they purchased for $40,000. 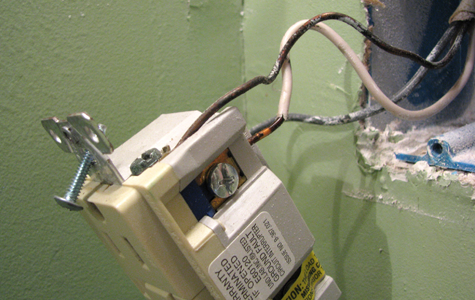 About a year after they moved in, the hallmark signs of defective drywall began to appear. They suffered constricted breathing, headaches and other health problems. Their dishwasher broke down, then their refrigerator. The air-conditioner failed soon after its coils corroded. “A bunch of jewelry kept turning black. I kept cleaning it and it kept turning black. I lost three TVs. My computer crashed. I bought a brand new one, and then that one crashed too,” Katherine Kallas said. 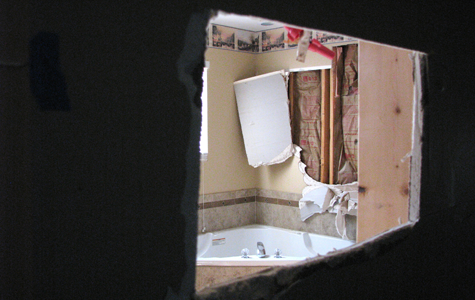 When a relative called in December 2008 and asked if the Kallases had heard about the Chinese drywall problem, the family became even more confused. John Kallas immediately climbed into the attic to see if he could find any Chinese trademarks on their drywall. Instead, he found markings for National Gypsum and U.S. Gypsum. 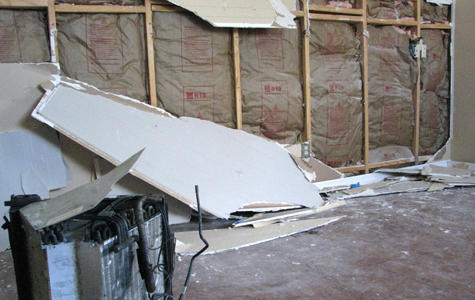 The Kallases hired Miami-based attorney, David Durkee, who was recruiting Chinese-drywall victims in Lee County, which has had more drywall problems than any other county in Florida. They also sought tax relief from the Lee County property appraiser’s office, which lowered the assessed value of their three-bedroom home. In 2009 the Kallases’ builder sent an inspector to examine the house. They soon received a letter confirming their fears. “Test results confirmed the presence of the effects from sulfide gases and the presence of drywall releasing these gases,” the company said in the letter. Builder K. Hovnanian offered to repair the Kallases’ home by removing all the wiring and drywall and then ventilating the house for 14 days before installing new drywall and wiring. But the Consumer Product Safety Commission hadn’t yet released its remediation protocol, and the Kallases worried that the builder’s plan might be inadequate. They rejected the offer and in February 2010 moved into a rented house. Katherine Kallas said their attorney “just kind of blew us off from there.” When she called Durkee to ask about her case, she said she got updates on the progress of the Chinese drywall litigation. “I’d have to remind him that I have American drywall, but he doesn’t seem interested in going after our manufacturer,” she said. Durkee told ProPublica and the Herald-Tribune that he isn’t suing National Gypsum or U.S. Gypsum because he is confident he can persuade the Kallases’ builder and drywall distributor to compensate them for their losses. The Kallases couldn’t afford to pay both their rent and their mortgage, so they stopped paying the mortgage. Eventually they received a foreclosure notice from their lender, Wells Fargo. Their home is scheduled to be auctioned later this month. The Kallases now worry that Wells Fargo will force them to pay the difference between what they owed on the house and what it will eventually sell for, which would force them to declare bankruptcy. “It’s terrible. It’s very upsetting. We thought we were responsible homeowners. We had never missed a mortgage payment before,” Katherine Kallas said. In Alva, Fla., about a dozen miles from the Kallases, George and Brenda Brincku were trying to figure out what was wrong with the 3,160-square-foot home they had built for themselves and their three children. Between 2006 and 2009, the Brinckus replaced the coils on their air-conditioning units seven times. At one point they demanded that the president of the company that made the air-conditioners visit their home and explain why his product kept breaking down. Other appliances faltered, too. Two laundry washers, one microwave, two computer printers, smoke alarms, lamps, answering machines, flashlights, cell phones and fans. They also had health problems. Someone always seemed to be coughing, and nearly everyone had severely irritated eyes. The Brinckus’ then-20-year old daughter, Ashley, had frequent bouts of dizziness and once fainted in her room. After Chinese drywall began making headlines, George Brincku crawled into the attic to check for signs of corrosion. When he emerged he said he was nauseated for three days and began having frequent nosebleeds. The Brinckus contacted the Florida Department of Health, the Consumer Product Safety Commission, their homeowner’s insurance company and their builder’s insurance company. Each time they were told that their house was exhibiting the signs of corrosion that are normally linked to Chinese drywall. But they couldn’t find any Chinese insignias on their board. The Brinckus eventually learned that most of their drywall was manufactured by National Gypsum, which told them it came from the company’s Apollo Beach drywall plant, about 130 miles north near Tampa. Some of the drywall was also made by U.S. Gypsum, but the Brinckus said test results later showed that the U.S. Gypsum board was not outgassing. In March 2009, National Gypsum sent 11 people to inspect the Brincku home. The team stayed for a week, removing dozens of pieces of drywall and taking samples of their water. The Brinckus prepared lunch for them almost every day. The Brincku case began attracting national attention when CBS News asked the University of Florida to test samples of defective drywall, including samples from the Brinckus’ home. Timothy Townsend, the environmental engineering professor whose team conducted the tests, said some of the Brinckus’ samples released an unusually high amount of sulfur gas. Townsend also tested several pieces of newly purchased American board and found that some released more sulfur than new Chinese drywall that CBS bought in China. When CBS showed National Gypsum the University of Florida findings, spokeswoman Nancy Spurlock said the company had commissioned its own tests, from Packer Engineering, which showed that its drywall didn’t produce enough sulfur gases to cause corrosion. But two later tests of the Brinckus’ drywall, conducted by environmental engineering firms, backed up the University of Florida results. According to Rimkus Engineering, which was hired by the Brinckus’ insurance company, one sample released carbon disulfide at a concentration of 880 parts per billion. A commercially purchased piece of drywall that Rimkus used as a baseline released less than 50 parts per billion. 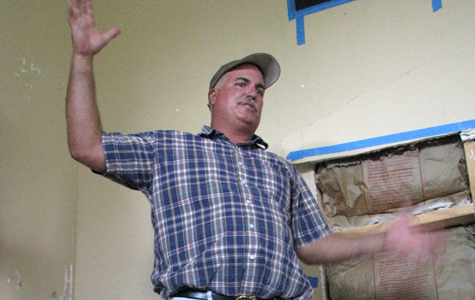 The other test was done pro-bono by Materials Analytical Services, which was developing a drywall inspection method. It found that one piece of board from the Brincku home released 120 parts per billion. Both companies also found that some pieces of drywall in the Brincku house weren’t outgassing much at all, which wasn’t surprising given that many homes are built with several brands of drywall. In a recent interview with ProPublica and the Herald-Tribune, Spurlock said National Gypsum still stands by its claim that its drywall isn’t outgassing sulfur at levels that can cause corrosion. She suggested instead that corrosion found in homes built with National Gypsum might be caused by sulfuric water, which is common in Florida. But according to copies of the Packer Engineering tests obtained by ProPublica and the Sarasota Herald-Tribune, none of the 21 water samples Packer took from the Brincku home had high amounts of sulfur. The Brinckus’ case against National Gypsum has been put on hold by Miami-based federal Judge Jose Martinez, who has determined that a similar lawsuit filed against National Gypsum in Arizona should be heard first. Meanwhile, the Brinckus are trying to avoid foreclosure. Last week they got some good news: Their lender, Fannie Mae, agreed to defer their loan payments until April 30. According to court documents filed by the Brinckus’ attorneys, 93 families now claim that drywall from National Gypsum’s Apollo Beach drywall plant is causing the problems in their homes. The lawsuit alleges that the FGD gypsum in the drywall has something to do with the outgassing. It also says that some recycled scrap drywall, perhaps Chinese drywall, may have been mixed in with the FGD gypsum. But Spurlock, the company spokeswoman, said the Apollo Beach plant doesn’t use recycled drywall. Apollo Beach uses FGD gypsum provided by Big Bend, a nearby coal-fired power plant operated by TECO Energy, a South Florida electric utility company. TECO didn’t return calls for comment on this story, but its website says its FGD gypsum is also used in concrete and fertilizer. Although the federal government does not regulate drywall, the EPA has spent the last two years drafting rules on the ash produced by coal-fired power plants, which forms the synthetic gypsum used in drywall. According to the EPA, several kinds of coal ash are produced when coal is burned to generate energy. Some types are potentially hazardous, including the toxic sludge that in 2008 spilled into a Tennessee community from a 1.1 billion gallon waste pond. Other types of coal ash, including FGD gypsum, are considered relatively harmless. But the proposed rule notes that the EPA didn’t conduct specific risk assessments for the use of coal ash in building materials and acknowledges that the ash could become problematic if improved scrubbing technologies remove more contaminants from the air. Most of the EPA’s past research into the reuse of gypsum has been done in conjunction with the gypsum industry, through its Coal Combustion Products Partnership. National Gypsum and the Gypsum Association have hired teams of lobbyists to try to shape the EPA’s new rules. Spurlock said the manufacturers fear that labeling any form of coal ash hazardous will create a “negative stigma” about FGD gypsum and that customers will be afraid to buy drywall made from it. “In their mind, it’s still hazardous so there is potential liability there. Anyone can sue for anything,” Spurlock said. Currently, the only standards that apply to drywall are voluntary guidelines for strength and fire resistance set by a committee comprised mostly of drywall manufacturers and builders. The committee is part of the American Society for Testing and Materials, an industry association that develops voluntary standards for a wide variety of products. The Consumer Product Safety Commission recently began talking with the committee about developing standards that would help prevent future outgassing problems. Michael Gardner, executive director of the Gypsum Association said his organization will be closely involved in those discussions. Among the many mysteries surrounding the American drywall problem is the one that is unfolding just outside Palm Springs, Calif., in the town of Indio. In the last year, two homeowners have abandoned their modest tract homes because they say their U.S.-made drywall was releasing so much sulfur gas that it made their eyes burn, caused bloody noses and constricted their breathing. The prevailing theory about defective drywall, Chinese or American, is that it affects only homes in hot, humid regions because the combination of heat and humidity exacerbates the release of the sulfur gases. But Indio is in the California desert, where rain is rare and humidity practically nonexistent. And while the families have complained of health problems, their homes show few signs of corrosion, aside from some discoloration on metal fixtures. Preliminary tests that the families had done by Assured Bio, an environmental engineering firm, and provided to ProPublica and the Herald Tribune show that their drywall is releasing sulfur gas at levels similar to those being released by Chinese drywall. The president of Assured Bio, Dr. Edward Sobek, said that while the tests raised concerns, another round of more sophisticated analysis needs to be done to determine whether the board corrodes metal. Those tests can cost hundreds of dollars and usually aren’t done unless a homeowner is planning to sue. But the Palm Springs families have had so much trouble finding lawyers that they’ve given up on that idea. “Everyone was hot to trot on the Chinese drywall, but attorneys don’t seem to want to have anything to do with American drywall cases,” said Kanda Simon. She and her husband abandoned their retirement home this year. In August they got a foreclosure notice. “I’m mad. I’m angry. I think it’s all very unfair, but I just don’t have the fight in me,” Simon said. Simon said she and her husband didn’t complain to their builder, Miami-based Lennar Corp., because their neighbor Robin Ely had such a difficult time dealing with the company. Ely, who has Parkinson’s disease, said she noticed a chemical smell in her home a few months after she moved in. When she complained to Lennar, she said she was told there couldn’t possibly be anything wrong with her house, because it was built with American drywall. Lennar later hired an environmental engineering firm to test Ely’s drywall, and Lennar told Ely the firm concluded that it wasn’t problematic. Lennar wouldn’t share its test results with Ely or ProPublica and the Sarasota Herald-Tribune. Ely tried to get legal help from a San Diego-based firm, Fuller Jenkins. At first, she said the firm was helpful and offered to inspect her home. But when they discovered that her board was made in the United States and not China, Ely said they lost interest. Craig Fuller, a partner with Fuller Jenkins, told ProPublica and the Sarasota Herald-Tribune that he “can’t comment on the case at this time” because his firm is still actively investigating and hasn’t filed a lawsuit yet. In July Ely moved into a rented apartment in Tennessee. She is trying to persuade her bank to defer the payments on her Palm Springs home, which is now scheduled for foreclosure on December 23rd. Correction, Jan. 19, 2016: This story originally stated that the home of Julie and Joseph Mraz was built with National Gypsum drywall. It was U.S. Gypsum.